This is a recipe that I’ve created over the years. I’ll substitute whatever kind of pepper I have around, but today it happened to be green peppers. I like my egg salad on the gooey side, so I use 1 cup of mayonnaise, but if you aren’t a huge mayo fan, you may want to use less. Combine all ingredients in a bowl and stir. Makes about 7 cups of egg salad. Serve with your favorite crackers or bread, or for a low carb alternative, serve on a bed of lettuce. 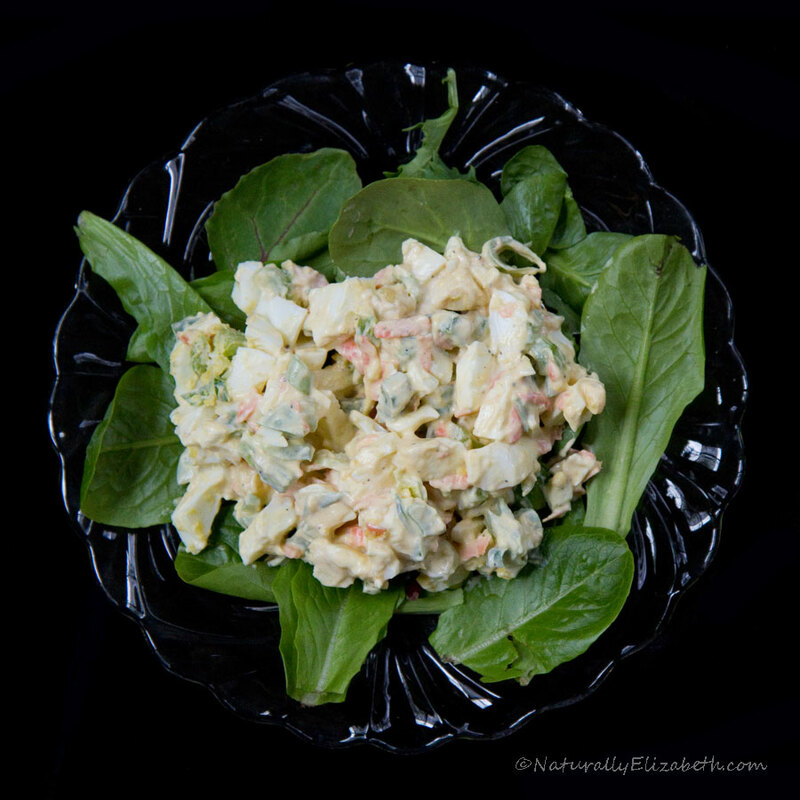 When I was breastfeeding my twins and eating anything and everything I could to keep up with the caloric demands of feeding two babies at once, this chicken salad was one of my major cravings. It was available in the deli at Whole Foods, and so I would pick it up as a quick lunch or snack. Unfortunately, it was expensive. I was thrilled when I found the recipe on the web so I could make it organic and much cheaper than the deli price. I was also able to leave out the nuts which I didn’t really like. Now that I can’t have red onions because they cause migraines for me, I substitute green onions instead. However, it tastes much better with the red onions! Cook the chicken as you prefer. I use either a crockpot (7 hours on low in my older model) or bake it in the oven (400F for about an hour). Allow to cool. Dice. In a medium bowl, combine the celery, mayonnaise, mustard, onion, tarragon, and pepper. Stir well, and add the chicken. Mix thoroughly. 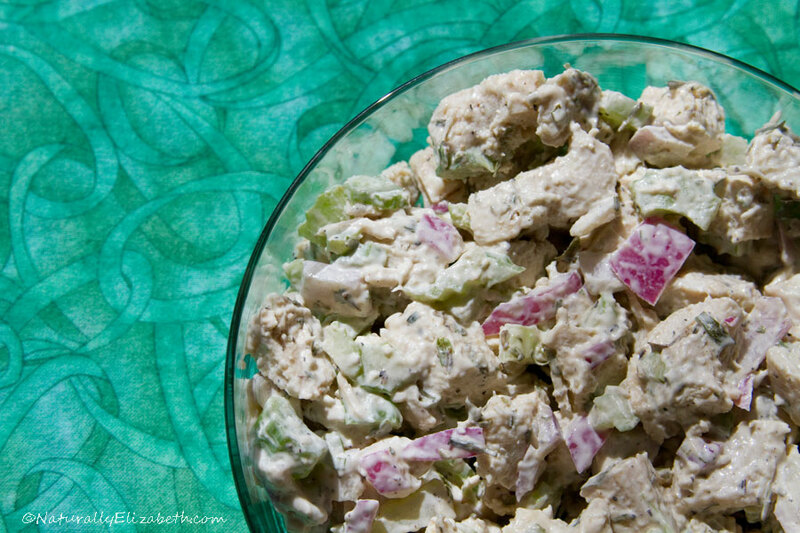 Serve as you prefer chicken salad. It tastes great with fresh lettuce and tomato on a slice of bread or served with crackers. I also use it as a filling for lettuce wraps. At one point in time, this recipe began as the Betty Crocker 40th Anniversary French Apple Pie. However, the crumb topping just didn’t quite have the flavor I wanted once I converted it to a gluten free recipe. I got the inspiration one afternoon to add coconut to the topping, and it made a huge and delicious difference. 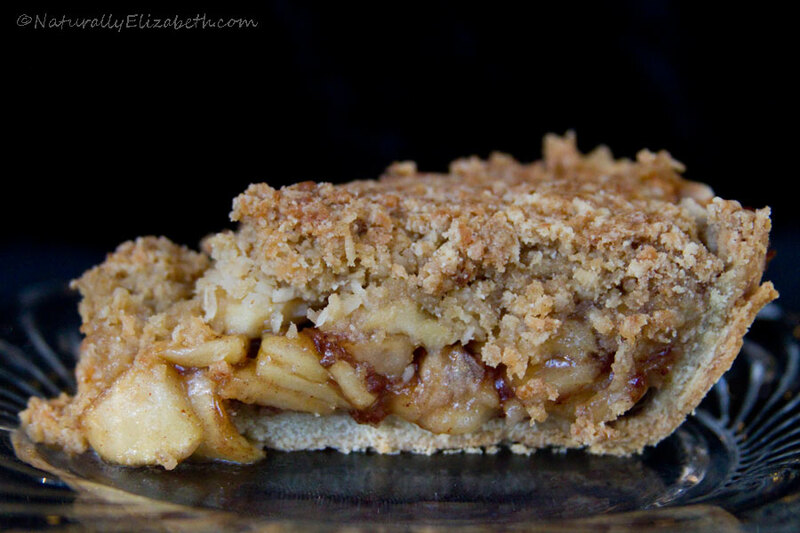 This is now a favorite recipe of mine even though I’m not a huge apple pie person. Peel and slice the apples and add the sucanat and cane sugar to them in an oven-proof bowl. Place them in the oven at 425F while it preheats to get them softening a bit. Mix together the dry ingredients for the crust. Cut the palm shortening in with a fork. Whisk the egg in a bowl and then mix it into the dough. Add water until the dough is moistened enough to stay together but isn’t goopy. Place the dough in a 10” pie pan. Using your fingers, press it into the pan along the bottom and sides. Set aside. Pull the apples and sugars out of the oven. Being careful of the hot bowl, add the remainder of the filling ingredients to the apples. Stir well. Pour the filling into the pie crust. Top with the crumb topping. Place the pie on a cookie sheet (to help with any spillovers) and cover with foil. Bake at 425F for about 50 minutes. Remove the foil and bake for another 10 minutes to brown the crumb topping. If the apple juices are not bubbling up on the sides at this point, re-cover with foil and put it back in the oven in 5 minute increments until it is bubbling and juicy. *To make this recipe dairy free, substitute palm shortening for the butter. It won’t be quite as flavorful, but it will still be good. When my kids were younger, all of them had sensitivities to garlic. This meant making our own pasta sauce since garlic is part of Italian recipes. 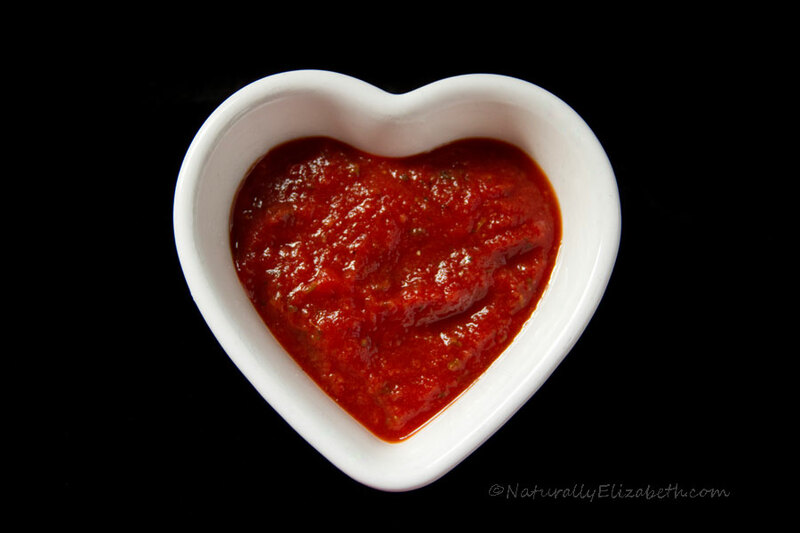 I tinkered around for a while and came up with this recipe which remains our favorite over jarred sauces even now that garlic is no longer an issue. I usually make a double or triple batch of this and then freeze it in batches of three cups of sauce per one quart mason jar. When we need sauce for pizza or pasta, I just have to remember to defrost a jar from the freezer. Thoroughly mix all ingredients in a pot with a lid. Cover and cook over medium until it starts to making popping noises. Reduce to simmer and cook for 20-40 minutes to allow seasonings to meld. *Substitute brown sugar if Sucanat isn’t something you keep around. Yes, I realize the icing is green. But the cake is yellow, I promise. My kids wanted green cupcakes for St. Patrick’s Day. While I’m all in favor of a good corned beef dinner to celebrate my Irish-American heritage, something in me cringes at green tinted things for St. Patrick’s Day, even if it is a natural food coloring. I can cope with tinting the icing, but not the cake itself. So these are the compromise. The icing (or frosting, depending on your regional preference) recipe below is really forgiving. I don’t usually use a recipe to make icing. I just throw things in a bowl and make it. Close really does count on this one. If it’s a little too runny, add more powdered sugar (which I have to do most of the time I make icing). If it’s a little too dry, add a few drops more of rice milk. It will all be good in the end. When it’s not tinted with food coloring, the icing will come out an off-white color. I use India Tree natural food coloring when my kids insist on colored icing. Preheat the oven to 350 F. Use canola oil or another neutral oil to oil 22-24 muffin tins. Set aside. In a large bowl, use a whisk or hand mixer to combine the sugar, palm shortening, vanilla extract, and eggs. Add in all of the flours, xanthan gum, sea salt, baking powder and rice milk. Use a mixing spoon to stir thoroughly. Fill the muffin tins half full with batter. Bake for 13-15 minutes at 350F until lightly browned and a toothpick comes out clean. * If you use millet flour, there will be a stronger, nuttier flavor to the cake. If you use almond meal, the flavor will be more neutral. Almonds carry a cross-contamination risk from tree nuts, so be careful using them in food for the nut allergic. Using an electric hand mixer, cream the shortening into the powdered sugar and vanilla extract, very slowly adding rice milk to get the right consistency. Add in food coloring if desired. I created this recipe many years ago when I was still eating gluten but I was reacting to eggs and my kids were reacting to dairy. 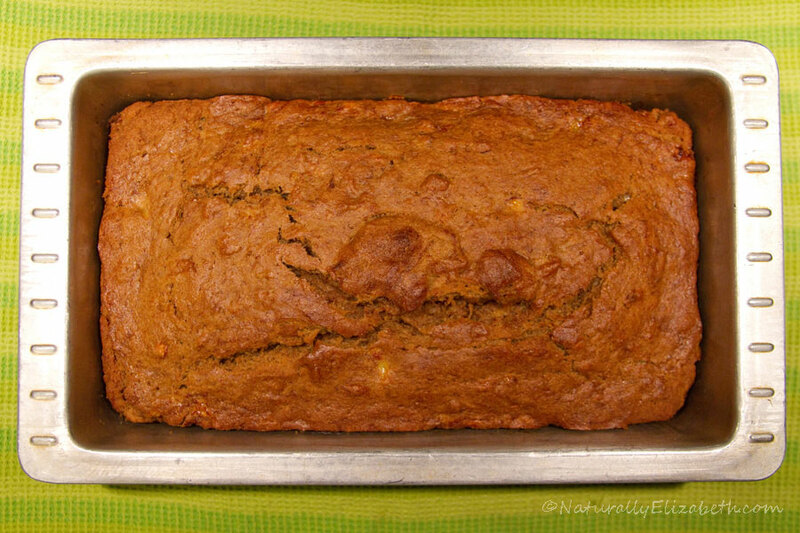 It is incredibly moist and delicious and always gets all kinds of compliments when I bring it to potlucks. I’m still tinkering with a gluten free version of it, but hopefully that will appear sometime in the near future. Preheat oven to 350F. Oil one bread pan. I use organic canola oil. Mix together the dry ingredients in a large bowl. In a medium sized bowl, mix together the dry ingredients. Stir the dry ingredients into the wet ingredients. Add the bananas and optional nuts and stir. Scoop into the oiled pan and bake for 60-70 minutes at 350F until a toothpick comes out clean and the top is a golden brown. My baking tends to be influenced by two things: Seasonal availability of ingredients and my own wacky cravings. When I was making strawberry pie the other day, I suddenly got hit by a craving for strawberry banana muffins. Actually, what I really wanted was strawberry blueberry banana muffins, but I didn’t have enough blueberries to make it work. So I made strawberry banana muffins instead. I am working on perfecting my gluten free banana bread recipe, and this was just a tangent on that process. 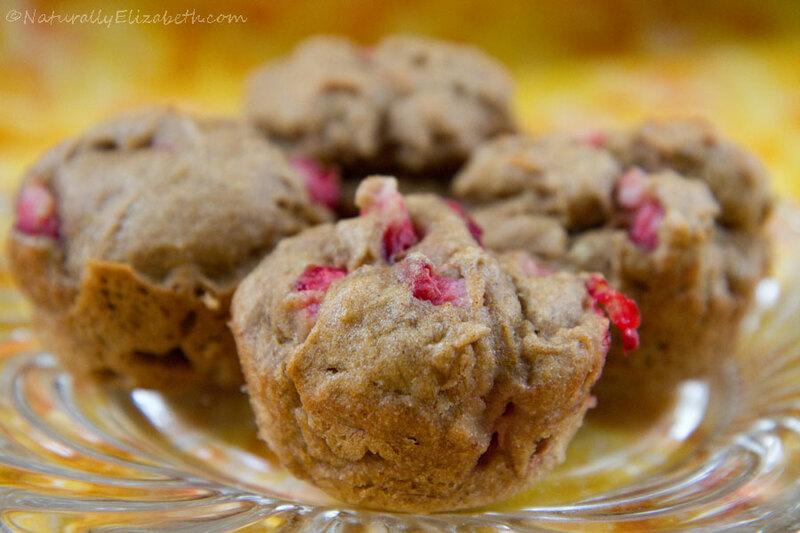 These taste great with butter or cashew butter on top. They’re not incredibly sweet, so honey would also make a great topping, too. In a large bowl, mix together the wet ingredients using a whisk. In a medium bowl, mix together the dry ingredients. Add the dry ingredients to the wet ingredients and mix thoroughly with a spoon. Stir in the bananas and the strawberries. Divide the batter between the 24 muffin tins, filling each about half full. Bake at 350F for about 15-17 minutes. This is a retively new recipe in our repertoire. I roasted some carrots and butternut squash one night for a soup recipe which we didn’t really like, but the veggies were a huge hit before they even went in the soup. My older son came by the kitchen counter where I was doing prep work and started enthusiastically snacking on the roasted veggies that were waiting to go in the soup. I admit to having eaten a few during the prep work, too, and they were pretty addictive. In this most recent edition of the roasted veggies, I only had fresh carrots from Johnson’s Backyard Garden. I didn’t have butternut squash, and my son protested vehemently. He thinks the butternut squash is the most important part. So next time I make it with butternut squash, I will post that recipe. There is a lot of pepper in this dish, but it tastes great this way in our opinion. Place the carrots, onion, and garlic in a mixing bowl. Add enough olive oil to lightly but thoroughly coat the veggies. Place into a 9×13” glass pan. Roast at 450F for 15 minutes. Take the pan out, stir the contents, and return to the oven for another 15 minutes. Remove from the oven, stir again, and return to the oven if needed. Total cooking time will be between 30-45 minutes depending on the size of your carrot sticks. 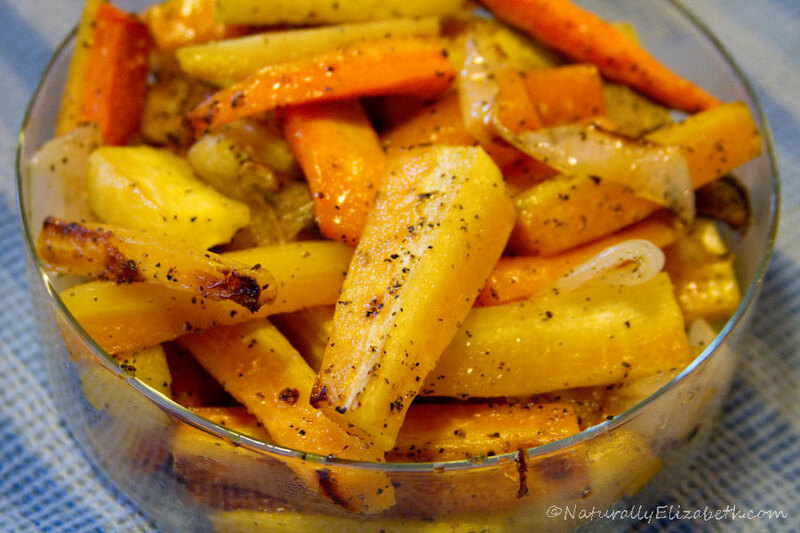 The previously promised roasted carrots post got bumped to tomorrow in honor of Pi (3.14) Day. We’re on spring break around here, so keeping track of the exact date hasn’t been high on my list of priorities! This is one of two strawberry pies that I make. The other is a double crust recipe. And then there is strawberry rhubarb pie… yum! That recipe will be posted when rhubarb starts showing up at the market. This particular pie is really sweet. I’ve made it in a gluten crust for my boys several times recently, but I hadn’t made a gluten free one for me to eat until today. I just tried it, and it is really good, but I could only handle a small amount. My blood sugar is going to complain about even that. Time to go eat some protein! The recipes for gluten free and wheat crusts are below. The filling is the same for both. To make the crust, cut the shortening (and butter if using) into the flours, xanthan gum and sea salt. Add the egg and enough water to moisten to dough consistency. Place the dough into a 9” pie pan and use your fingers to spread it evenly. Poke holes in the bottom and bake at 475 for 7-9 minutes. Set aside. Mash the 1.5 cups of diced strawberries. Add them and the sugar to a small pan. 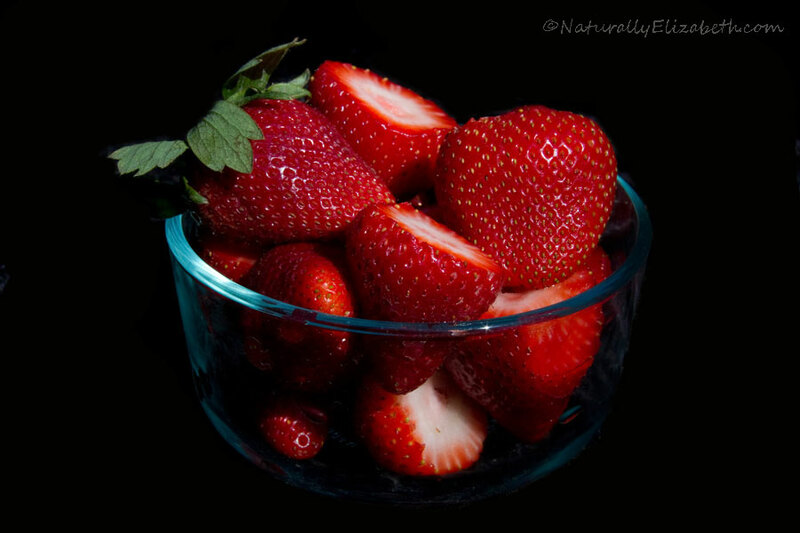 Blend the cornstarch with the water and combine with the strawberries and sugar. Cook over medium heat until it comes to a boil, stirring often. Reduce to simmer until thickened, about 10 minutes, continuing to stir frequently. Place the 3.5 cups of sliced strawberries in the pie crust. Cover with the glaze mixture. Allow to cool in the refrigerator for several hours before serving. *If you want this to be nut free (though almonds aren’t a true nut but carry the risk of cross-contamination), substitute organic millet flour for the almond meal. ** If you are not dairy free, 1/6 cup palm shortening and 1/6 cup organic butter softened to room temperature make for a better crust. However, it still works great to use 1/3 cup palm shortening. We can pretend like these just came out of my kids’ garden, but they didn’t. To make the crust, cut the shortening into the flours and sea salt. Add water to moisten to dough consistency. Roll out using additional flour to prevent sticking to the counter and put in a 9” pie pan. Poke holes in the bottom and bake at 475 for 8-10 minutes. Set aside. 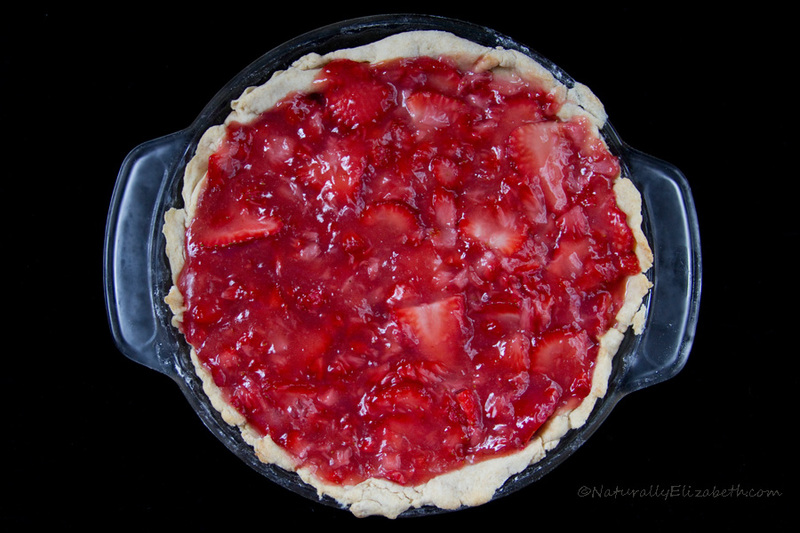 Place the 3.5 cups of slice strawberries in the pie crust. Cover with the glaze mixture. Allow to cool in the refrigerator for several hours before serving. Oven roasted carrots (recipe soon), rainbow chard sautéed with garlic and red wine vinegar, and beef stroganoff on a bed of brown basmati rice. I subbed orange pepper for green in this edition of the recipe. 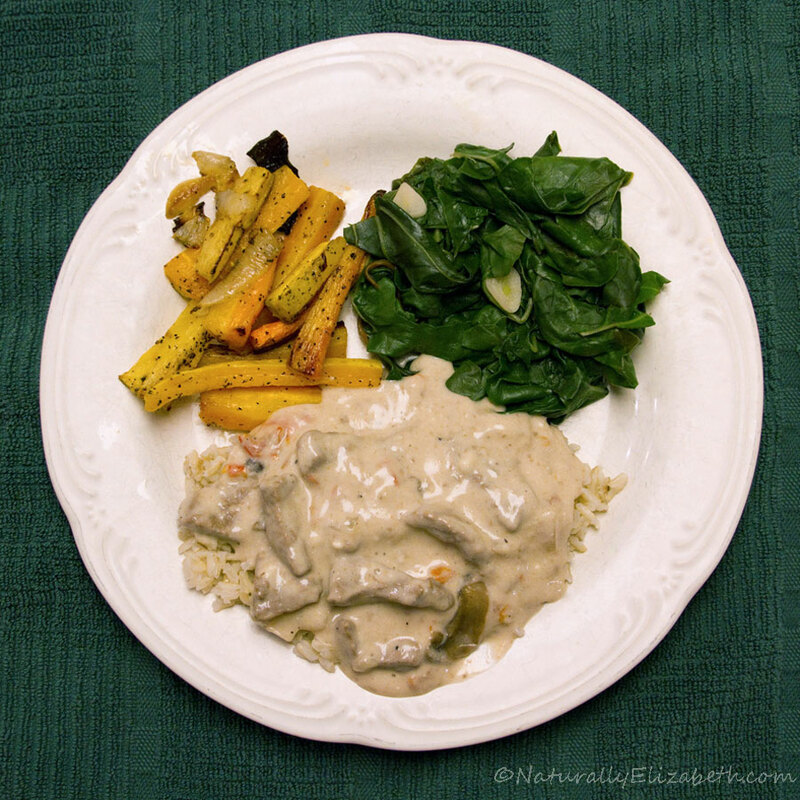 Beef stroganoff is one of a handful of dishes that will always remind me of my paternal grandmother because she made a great version that she served often. However, her version involved all kinds of canned and highly processed conventional items that I choose not to eat. As a result, I set out to create a recipe that was more organic friendly and that my family would eat. There are two items that my family will outright rebel if I serve to them: mushrooms and peas. I love both with my stroganoff, but I’m alone on this one around here. So while stroganoff recipes usually have mushrooms in them, this one doesn’t. If I want mushrooms in mine, I will sauté them separately and add them in to my portion, sparing the rest of the family the agony of such a torturous food. The photo above has mushrooms added in. I grew up eating beef stroganoff with gluten based egg noodles, but my current family unit prefers brown rice over pasta with stroganoff. Sauté the onion, stew meat, green pepper, and garlic over medium heat; I use a 3.5 quart pot. When the meat is browned and the onions are almost or completely translucent, add enough broth to submerge the meat mixture. Stir in the salt and pepper. Cover and allow to simmer for about 45-60 minutes until the meat is tender. In a small bowl, stir the cornstarch into sour cream. Add about ½ cup of the broth from the pot to help liquefy the concoction a bit. Add the sour cream mixture to the pot, stirring quickly to prevent clumping. Allow to thicken (it only takes a minute or two) and then serve with rice or noodles.